Joshua Harris Miller was born July 14, 1970 in Queens, New York and grew up in East Brunswick, New Jersey. A terrific all-around athlete, Josh had powerful legs and tremendous leaping ability. As a varsity athlete for the East Brunswick High Bears, he lettered in basketball and track, as a high jumper, and was a receiver and kicker on the football team. Though Josh was not seriously recruited, he believed he had a future in football. He enrolled at Scottsdale Community College in Arizona, and served as the school’s punter for two seasons. Josh earned All-Western State honors in both 1988 and 1989, and was given a scholarship to the University of Arizona. As a senior in 1992, he averaged better than 45 yards a punt for the Wildcats, earning All-Pac 10 honors and making a handful of All-American lists. Josh was not drafted by any NFL team. 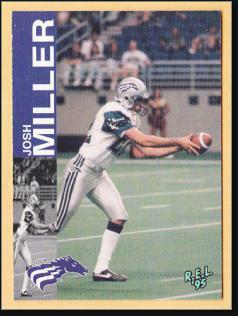 He punted for the Baltimore Stallions of the CFL for two years, helping the club win the Grey Cup in 1995. Playing in the U.S. kept Josh on the radar of NFL scouts, and in 1996 he signed with the Pittsburgh Steelers. He replaced veteran Rohn Stark and played for the Steelers for eight seasons. In his final year with the club, he completed an 81-yard touchdown pass against the Ravens on a fake punt play that tied a record for the longest pass play by a non-quarterback. Josh signed with the Patriots as a free agent in 2004. New England made it to the Super Bowl that year and defeated the Eagles, 24–21. His punt pinning the Eagles on their own 4 yard line with under a minute left sealed the Pats’ victory. After two more years in New England, Josh finished his NFL career with the Tennessee Titans. After retiring, he went into radio and television broadcasting in Pittsburgh.